The car accident legal process offers a number of alternatives to having your case go to trial. An overwhelming number of accident claims are settled before trial but the process to get to settlement, or trial, can be long and arduous in some cases. Whether your case goes to trial largely depends on issues of liability and causation, if the settlement offer is too low or the demand too high and the respective parties refuse to compromise. Car accident claims begin with you or your car accident lawyer notifying the responsible party’s insurer that an accident claim is being presented. In Massachusetts, you have three years to negotiate a settlement or file your claim in court or you can lose your right to any compensation for most cases. Your attorney can monitor your medical progress, obtain documents such as the traffic accident report, property damage estimate, photographs of the cars and accident scene, wage records, medical records and reports about your injuries and prognosis. If your medical condition stabilizes or if the three-year statute of limitations is about to expire, your lawyer will present a demand for settlement, which may be for the defendant insured’s policy limits depending on the extent of your injury and the liability limits. The parties can try to resolve the case before trial by submitting to mediation where a neutral party, usually an attorney, listens to the evidence presented by both sides, asks each to consider their weak and strong points, and sees if middle ground can be reached. There is also arbitration, which can be binding or non-binding. A non-binding process is helpful in that a mini-trial can be held with an arbitrator ruling on the evidence presented and issuing an award or non-award, which either party may reject and proceed to trial. 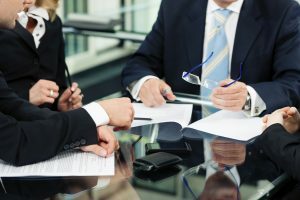 Binding arbitration is held either before one arbitrator or a panel of arbitrators in larger cases, such as where a product defect may have been a factor in the car accident, and the process more like a trial with the arbitrators generally retired judges. Otherwise, the trial judge may attempt settlement with pretrial conferences and its own settlement conference just before trial. Getting to trial can take years in some cases because of the backlog of civil cases. Experts, which are required in some case, usually charge significant sums to prepare and to testify and juries are notorious for either awarding too little or too much, based on factors that may have little to do with the facts of the case. Few attorneys like taking cases to trial and many settle rather than taking a chance at losing thousands of dollars in expenses or in exposing their lack of preparation or adequacy in arguing a case. For your car accident in Boston, consult Neil Burns, a proven litigator with over 25 years of accident claim experience who is prepared to take your case to trial if necessary or who can negotiate a reasonable and satisfactory settlement for your accident claim. Call him today for a free, confidential evaluation of your car accident claim at (617) 227-7423.